One does not often associate cheese tea, but the two make a great pair. In Pursuit of Tea hosted a tea and cheese tasting in November 2010 at its pop-up shop in the SoHo neighborhood of New York City. The tasting was led by In Pursuit co-founder Sebastien Beckwith; Saxelby Cheesemongers co-owner Benoit Breal; and French Culinary Institute chef instructor Melanie Franks. There were 14 women in attendance including me. 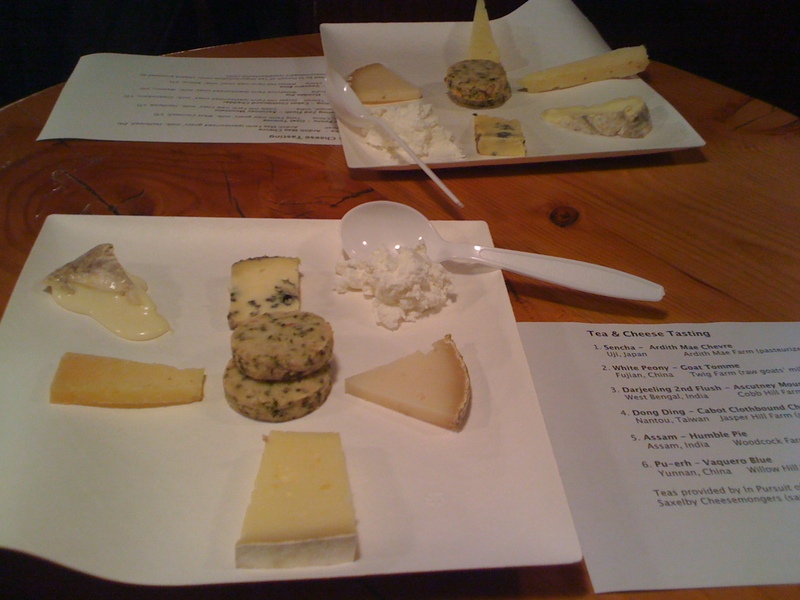 Melanie Franks told the group that when pairing tea and cheese one should consider complementary or contrasting flavors. For example, salty cheese (chevre) + sweet tea (green or white). Another consideration is cutting the tannic flavors of a tea (Darjeeling) with a fatty cheese or smoothing out the acidity/astringency of a tea (Sencha) with a thick cheese. The floral (nose), soapy (taste) tea paired with the cheese yielded a gamey taste. The cheese rind in combination with the tea produced an ashy taste at the back of my throat. One of my favorite pairings. A fruity cheese combined with this astringent tea reminded me of a Bavarian spaetzle (similar to macaroni and cheese). A toasted, floral green paired with this cheddar resulted in a salty flavor. The Dong Ding tasted with the Ascutney produced mushroom flavors. Malty Assam paired with this brie-like cheese filled my mouth with cocoa flavors. 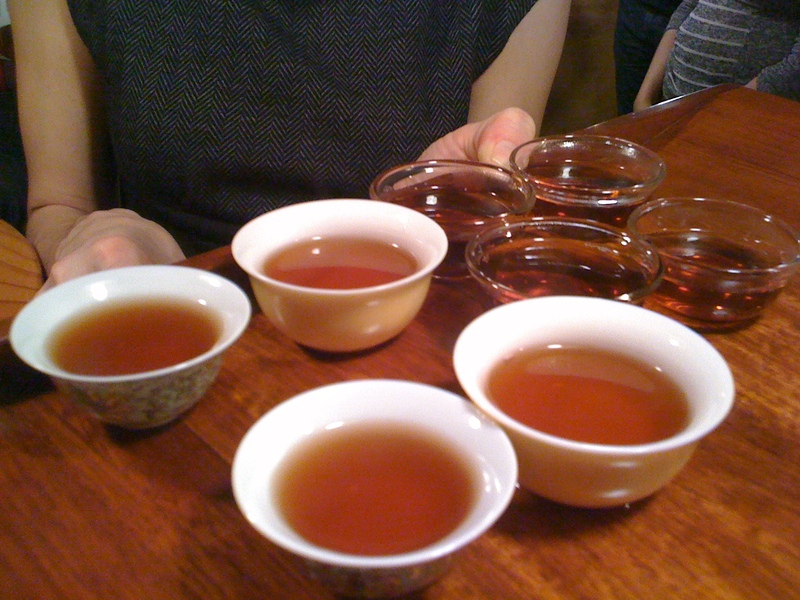 One of my favorite pairings; the roasted, barny pu'erh combined with this blue tasted like butter, salt, and oysters! 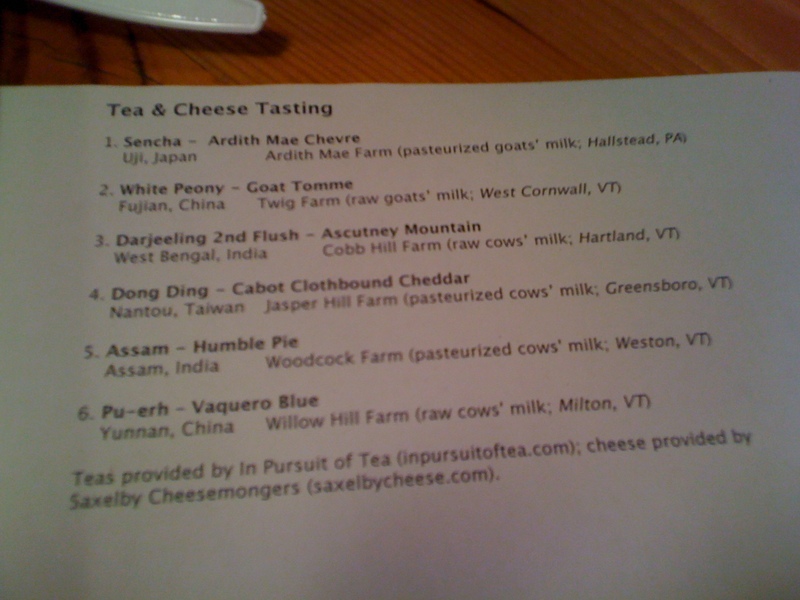 A tea and cheese tasting? Oh my! Yum! It would have been a pleasure to meet you at the tea and cheese tasting. Where were you sitting? Alexis, I was sitting in the back center, a youngish black woman wearing glasses. I have a people photo from the event and will post it soon. I think we were sitting at the same table. Do share the photo so I can be sure. How wonderful!